Left-Hook Lounge: Vivek Wallace touches on Mayweather/Guerrero, Canelo, Ortiz, & Rosado vs Love! Marv G. (Charlotte, NC): Despite the layoff, time in jail, and partying, I really thought Mayweather looked incredible. Do you think Guerrero was just a joke? Or do you think Floyd is really that good? Vivek W. (ESB): We’ve seen quite a few fighters around the sport enter the ring with far less time off and the effects the layoff is typically very much pronounced. I don’t care who you are and what your profession is, you’d be hard-pressed to see anyone take that amount of time off and still be able to execute at such a high level. I saw a few things that let me know Mayweather isn’t totally who he used to be. But in the end, what I saw most is that he doesn’t have to be. Michael Jordan at 90% was still heads above everyone across from him. In the case of Floyd Mayweather, I don’t think things are any different. Robert Guerrero actually surprised me! His ring intelligence and the collective team game-planning of Team Guerrero was incredibly proficient. I think they had a solid plan. I think he came in and executed it brilliantly. As a matter of fact, I think he fought a more intelligent fight than any Mayweather opponent in recent history, excluding Cotto. In the end, it simply didn’t matter. Where the typical fighter gets caught in the moment…..Floyd finds a way to defeat you within the second. In other words, when the opponent is saying to himself “he just connected from the left, this time I’m gonna go right”, Mayweather is saying to himself, “I just went to the left, this time, let me feint to the left, fake the right, THEN land again with the left”. Hi-tech stuff, but that’s how developed his mental warfare truly is. I hate to say this because it’s a direct quote of his, but for lack of better terms, “there’s no way to gameplan for [him]”. He never does the same thing twice. The many variables of his game make him a very difficult puzzle to solve. Broadcasters spoke of how he threw the right hand about 5 or 6 different ways. So not only does an opponent have to worry about which hand he will throw, but also from which angle it may come. So they have to figure that out, and avoid it in real-time – which, with his speed happens in the blink of an eye. It’s Chinese arithmetic. It’s unreal! I don’t think Guerrero could have done anything better. He was conditioned. He executed a very solid gameplan. He varied his attack. And he wasn’t intimidated. He simply fell victim to the same man 43 other guys had no answer for. I don’t think Guerrero was a joke on any level. I just think the man he stood across from was a riddle. One that’s far from easy to solve. Caeser V. (London, UK): I respect your position on several issues in the sport and I’d like to hear you take a shot at this: Mayweather has dominated the sport for nearly two decades. Canelo has never had his own PPV and technically, only has a few notable names on his resume. Why such pressure from the media to see this fight now rather than let it build up? A year ago, Guerrero was a decent fighter but not quite at the elite level. Suddenly, he started calling Mayweather out. His promoter and those close to him began the buzz. Somewhere along the line, the media began to listen (which is what also happened with a young Victor Ortiz). Here we are today, a stage which I aptly call “the mourning after” (pun intended), where that opponent who finally found himself thrust into a position he wasn’t quite ready for has had the opportunity and lost it…..forever. One thing could have potentially made this opportunity turn out a little better. That thing: patience. By that, I mean taking the time to polish his game and come as humanly possible to perfecting his craft. Patience enough to EARN the right to reach that stage, by earning the respect of fight fans along the way while perfecting your craft and getting in rounds. Canelo has beaten a very solid Austin Trout and a shop-worn Shane Mosley. But short of those two and maybe another, can we truly say he’s battle tested enough to take perform at his prime peak in this fight now? And after that question, ask yourself, is he developed enough at this early stage to truly get the job done? I can’t answer those questions. I like his progress and developmental evolution, but I can’t answer those questions. The reason I’d rather wait for the fight is because I don’t think he can (honestly) either. More than likely it’ll be a one shot deal. Why chance it? Rather than preparing ones self to the utmost to seize the moment when that time comes. Another reason I think this fight should wait is because Mayweather has 5 fights remaining on this deal. If this is the biggest draw on the radar, you can’t take it as the #2 fight with four remaining. Why not allow that draw to build himself up as the fight builds itself up? One other benefit in that equation is the fact that Mayweather is aging. Another year or two certainly can’t hurt Canelo’s chances. So in a nutshell, I don’t agree with the media and fans who continue to push this fight as a “NOW” event. Let it build. Let Canelo build himself and his own legend. Just my thoughts…..Because once it happens, what next? Hector J. (Oakland, CA): There’s discussion of Robert Guerrero facing Victor Ortiz next. If that fight were to happen, how do you see it playing out? Vivek W. (ESB): I think it’s a very good fight. I think there’s equivalent benefit in it for both men. I think both are at the same point in their careers. They have each taken a stab at the biggest competitor they can ever face. Their respective shots at that individual (Mayweather) came perhaps earlier than it should have. But in the aftermath, all they can do now is simply establish themselves at a more natural pace against the remaining top competition and etch their name and legacy in stone. The reality here is that we still don’t know how good Guerrero or Ortiz will become. They’re both relatively young. And they both are still hungry with room for growth. I like the fight. I like the fight a lot! And if it were to happen, although I like Ortiz’s power, I would lean to the overall skills of Guerrero. If Guerrero doesn’t get caught in a fire fight and takes a shot too wicked to recover from, I like his chances of very strongly. Better boxer. Better fighter. Les H. (Coral Springs, FL): I had J’Leon Love losing that fight against Gabe Rosado. What did you think of the outcome of that fight? Vivek W. (ESB): Going into that fight I had Rosado coming out on top and in the aftermath, I don’t think that opinion changed any. I think Rosado did enough to earn the nod, but that being said, I don’t think the results reached the level of what I would term a “robbery” either. It was a close fight. I think Rosado should have gotten it, but I always try to approach things from contrasting angles, so here goes. When Lara lost to Williams and everyone else said Williams lost, I disagreed. I disagreed for the fact that Lara knew coming in that Williams was the house fighter and the bigger name……the bigger draw…..so he should have put himself in place to take it out of the judges hands and leave no doubt. With the knockdowns, some would argue Rosado did that. But the reality is that there were several points where he consistently got tagged and had no answer. There were other points where he took parts of certain rounds off and didn’t press. In a close round, those type of rounds are always gonna go to the house fighter. That’s why a fighter in he and Lara’s position has to fight every second of every round and leave no room for error. Anything less fails the test. The odds are against men like them. This is something a fighter on the B-side of a promotion should understand coming in. Again, I think Rosado should have won, but I can purely see why he ended up losing. It’s the nature of the beast and that’s one of the things I hate about the sport I love. I hope Rosado can get back on his horse and ride into greener pastures. The kid has heart….he has his own lil’ ring swag….. and he’s evolving. I think he’s a steady litmus test for anyone in front of him. If he has any learning curve right now, it’s the fact that he needs to stay in “permanent press” mode if he truly wants to knock these type of wrinkles out of his career. He doesn’t always press the action for the duration, and being a B-side fighter on the promotion, he’ll get the short end of the stick every time. This happened to Lucas Matthyssee with Judah and Alexander. He responded by building himself enough to become a bigger attraction that could now expect to get those close nods. A few adjustments and Rosado could be there too. (Vivek “Vito” Wallace can be heard tonight at 9ET/6PT on “Left-Hook Lounge Radio”. He can be reached at 954.300.5692, Twitter (@vivekwallace747), Instagram (viveksview), and FaceBook). 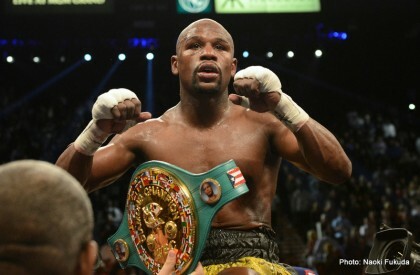 Next boxing news: Amir Khan vs. Floyd Mayweather Jr. in 2014? You are here: Home / Boxing News / Left-Hook Lounge: Vivek Wallace touches on Mayweather/Guerrero, Canelo, Ortiz, & Rosado vs Love!